Within a two-way dynamic between the particular and the atmospheric, new qualities emerge from the interplay between particles and systems. Lecturer, Interior Design, RMIT University, Melbourne, Australia. Reference this essay: Cottrell, Chris. “Notes for Atmospheric-Making.” In Leonardo Electronic Almanac 22, no. 1, edited by Lanfranco Aceti, Paul Thomas, and Edward Colless. Cambridge, MA: LEA / MIT Press, 2017. Taking turbulence as both a conceptual driver and organizational strategy, this paper examines the coming together of particular ideas, materials, and processes in a collection of recent drawings, installations, and performative works. These projects were developed through an experimental practice of ‘atmospheric-making,’ which involves reciprocal capacities of affecting and being affected by atmospheres. Within this two-way dynamic between the particular and the atmospheric, new qualities emerge from the interplay between particles and systems. Three modes of crossing between the particular and the atmospheric will be discussed. The first involves developing relations between material and immaterial media in order to inhabit a threshold position between the two. In the second, these (im)materials are used to activate spaces of ‘betweenness,’ drawing attention to these liminal zones. The final crossing-between is a series of bodily practices that open up relationally in order to embrace uncertainty, vagueness, and changefulness. These three approaches privilege a bodily process of ‘figuring out,’ requiring immersion and active participation in making sense of atmospheric conditions. This bodily engagement results in a blurring of the distinct sense of self, and challenges participants to take part in a process of co-formation between environmental surroundings and distributed presence. Figure 1. Chris Cottrell, Breathing. Space. #1, 2012. Photograph by Hsu Han Chiang. © Chris Cottrell, 2012. Used with permission. In what ways do materials, ideas, and methodologies influence and form aspects of creative processes? How do environmental qualities become integrated with thoughts, materials, and artifacts? What sort of practice might be formed in response to these issues? This paper will discuss the untidy and unpredictable happenings within the making-thinking-feeling of creative spatial practice, specifically concerned with design that engages with and within a cloudy, indeterminate, atmospheric condition. There are three different modes of crossing-between—between materials, spaces, and bodily activities—that together constitute atmospheric-making. These ideas are discussed in relation to a collection of creative works that I call ‘studio sketches,’ wherein materials, ideas, and forces are quickly and intuitively brought together in order to test possibilities for further development and refinement. The current series of studio sketches are collected under the title Breathing. Space. This title was chosen for its multivalence—spaces for breathing, spaces that are ‘breathing,’ and the idea of a moment of pause or suspension. These projects investigate the spatiality of breathing, and also provide me with a means to continue to test out ideas, loose ends, and works-in-progress through a studio-based process of material-sketching, which in turn involves staying attuned and developing sensitivity to material qualities. To pursue a practice of atmospheric-making is to work with and within an awareness of the influences of context. As the cultural geographer Kathleen Stewart writes, “an atmosphere is not an inert context but a force field in which people find themselves. It is not an effect of other forces but a lived affect—a capacity to affect and to be affected that pushes a present into a composition, an expressivity, the sense of potentiality and event.”  Atmospheric-making operates as two reciprocal processes; as Stewart suggests, it is to affect and to be affected. Firstly, there are processes of making in which matter is pushed in order to engage with the ephemeral and the immaterial to in turn generate contingent, amorphous formations and potentialities. But there is also an affective pushing-back by matter. Being aware of this sometimes overt, often subtle, pushing-back entails developing an attunement to the “forces of material-sensory somethings forming up.”  That is, it involves being attuned to these qualities of indeterminacy and vagueness that exist around and between collectives. With this mode of working, there are continually shifting dynamics in how the particular—whether that be particles of thought, feelings, or matter—comes together and forms new collective possibilities. This could be thought of as a turbulent process, because when things become disrupted and unpredictable, new qualities emerge from the interplay of relations between lived activities, particles, systems, and processes. Turbulence also underscores that these relations are reactive—always on the move—and that these relations sometimes invite us, but more often force us to move with them. Figure 2. Chris Cottrell, Breathing. Space. #7: Drawing of Breath, 2013. Lungful of air, drawing ink on paper. Detail. 7 cm x 4 cm. © Chris Cottrell, 2013. Used with permission. Often seen as a practice of order and control, I am approaching these issues from a background in architecture with the hope to alter these notions by staying open to ideas of turbulence. In his paper Towards Turbulence, Mark Wigley notes that “buildings have always been seen to stabilize, to secure, to produce a sense of order in a chaotic world. Architectural discourse begins with the thought that the first buildings kept turbulence outside.”  What if architectural practice were to include and accept the influences of turbulence, rather than resist them? How would this change the way we think about spaces and creative spatial practices? In the Breathing. Space. projects, both what is made and the process by which it is made hold qualities of indeterminacy. Moments of uncertainty and indeterminacy are compelling because they invite a ‘figuring out,’ which is an open-ended, potentially endless process. My practice seeks to develop techniques for coexisting with indeterminacy, for becoming clearer about moments of vagueness. Within the two-way processes of affecting and being affected are the material, spatial, and bodily modes of crossing between the particular and the atmospheric that I identify as constituting my practice of atmospheric-making. Figure 3. Chris Cottrell, Scott Andrew Elliott et. al., Bhubble, 2013. 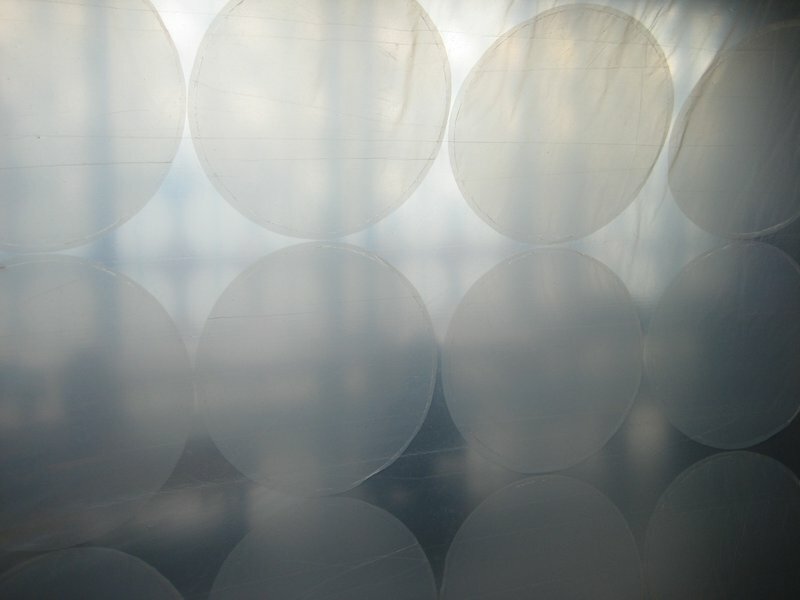 Polythene sheet, fan, 4.2 m x 1.8 x 2.4 m. Installation view at RMIT Design Hub. Photograph by Chris Cottrell. © Chris Cottrell, 2013. Courtesy of the artist. These are all evident in the Bhubble project (Figure 3), which was one of several outcomes of a collaborative workshop I initiated with Scott Andrew Elliott, Olivia Pintos-Lopez, and Pia Ednie-Brown. The workshop involved a small cohort of senior interior design and architecture students and took place at the Royal Melbourne Institute of Technology University (RMIT) in 2013. 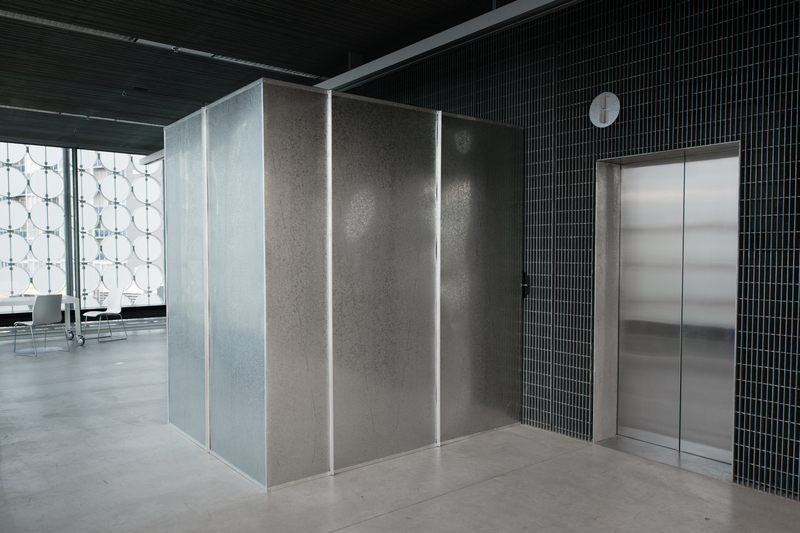 Bhubble consisted of a pressurized, inflatable room adjoining two elevator doors, patterned with a recurring dot motif. When the doors opened, the change in pressure caused the space to slightly deflate, and as they closed, the space slowly re-inflated to its maximum dimensions. The first of the three modes of crossing-between that makes up the practice of atmospheric-making is the material ‘between.’ This involves developing relations between material and immaterial media in order to inhabit the threshold between the two. In Bhubble, layers of translucency set up relationships between the polythene skin of the inflatable space, the facade of the building, and the environment beyond. This use of translucency flattened and condensed surface relationships into a single, contiguous interior surface. With respect to the second mode, materiality can be used to draw attention to spatial ‘betweens,’ points where materials cross boundaries from matter into particulate atmospheres, or change from one state into another. The structure was supported by air pressure, and the subtle and contingent dynamics of this became visible and understandable with each opening and closing of the elevator doors. Finally, there are bodily practices that imply conditions of being ‘between’—listening, conscious breathing, or, in this case, simply walking or moving through space—that clearly situate an audience in a bodily process of ‘figuring out.’ Stepping out of the elevator involved moving into a space that slowly closed in and collapsed around you. This was not a particularly reassuring experience, but there were few alternatives: either step back into the elevator or press on and see what happens. The Bhubble project was also the outcome of another type of turbulence in practice: collaboration, which can be chaotic and confusing, but also generative and constructively unpredictable. The very short period over which the workshop took place added an additional force: problems had to be solved, or alternative approaches developed, very quickly. The group addressed the question of how to join edges of polythene sheet together without drawing attention to these joints by covering the polythene skin in an additional layer of polythene discs. This solution significantly transformed the design and integrated it within its context, while also opening up several other challenges that needed to be addressed, and so on. This time-pressured, collective, material improvisation has parallels with what Francisco Varela calls “immediate coping;” that is, dealing with problems at hand through an enactive approach to cognition. Like the two-way dynamic present in the idea of atmospheric-making, immediate coping is based on two reciprocal ideas: “that perception consists of perceptually guided action, and that cognitive structures emerge from the recurrent sensorimotor patterns that enable action to be perceptually guided.”  Immediate coping occurs at moments of breakdown and uncertainty; it is in unfamiliar circumstances that we, as no longer experts, stop deliberating or analyzing and become like beginners seeking ways to feel at ease. In beginning again, we are guided intuitively by the forces and relations of things around us, responding to affects that “work on the body, bringing to the fore the experiential force of the quasi chaos [or turbulence] of the not-quite-seen.”  Developing awareness of these subtle dynamics involves “working at the limit of a body’s capacity to actualize;” indeed, “this perceiving-with affectively reworks what a body can do.”  This is the idea of attunement, which I will return to shortly. The point I want to emphasize here is that thinking, making, and bodily capacity reinforce and develop alongside each other. Figure 4. Chris Cottrell, Scott Andrew Elliott et. al., Building Movements #2, 2013. 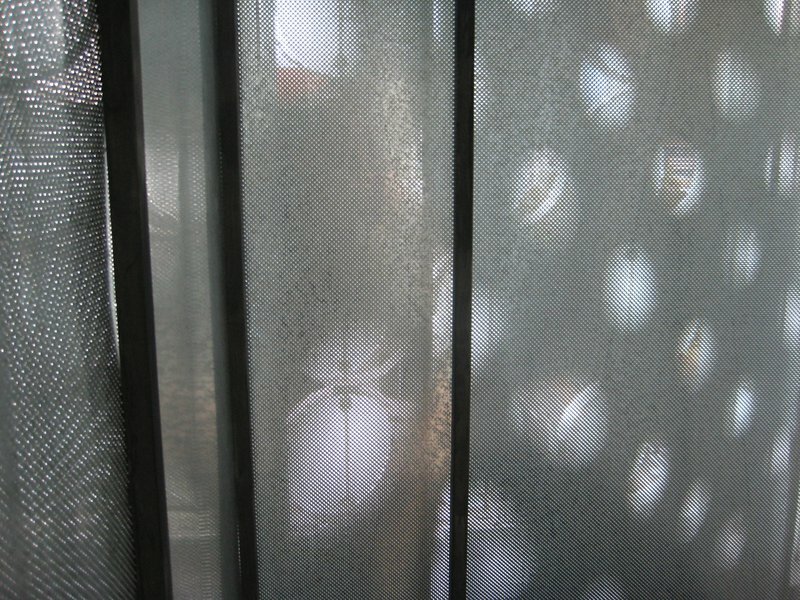 Perforated metal sheet and aluminum angle, 2.5 m x 2.0 x 2.4 m. Installation view at RMIT Design Hub. Photograph by Georgina Matherson. © Chris Cottrell, Scott Andrew Elliott et. al., 2013. Used with permission. Figure 5. Chris Cottrell, Scott Andrew Elliott et. al., Building Movements #2, 2013. 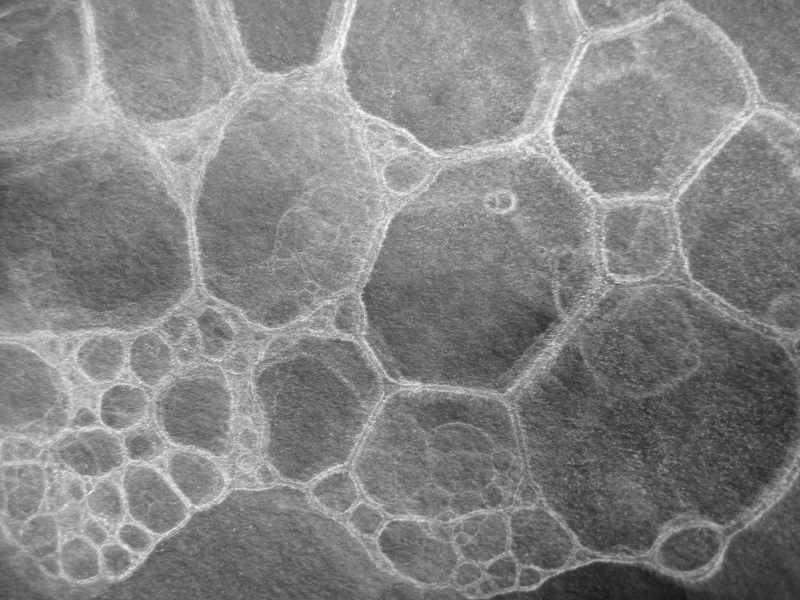 View of moiré effect. Photograph by Chris Cottrell. © Chris Cottrell, 2013. Courtesy of the artist. But let us return to these ideas of movement and turbulence, and the existence of a generative, relational process of material experimentation between the particular and the diffusely atmospheric. A clear instance of this would be the creation of moiré in Building Movements #2 (figure 4 and 5), which was another of these collaborative projects that made use of the techniques of material-between, spatial-between, and activity. A rectilinear structure clad in perforated metal was installed in front of the entrance to another set of elevator doors. To enter or exit the elevator, visitors had to create a narrow space by pushing a secondary volume, also clad in perforated metal, and then physically negotiate this space. The movement of people between these layers of perforated metal sheets created a dazzling, perceptual effect, one that confused ideas of proximity and spatial certainty contingent on bodily movement. The moiré changes how we think. To draw on Manning again: “moving with movement requires an altered idea of consciousness. This consciousness is not of the body but with the body moving.”  There is a bodily awareness, a feeling-with of the moving body, and “this feeling-with is a virtual dance … too quick for conscious thought, and yet it composes with it as a layering of felt experience in the making.”  That this is “too quick for conscious thought” suggests that in encounters of uncertainty, such as in the case of a moiré, we must continually practice immediate coping in an attempt to cognitively keep up with our bodily selves. We are implicated with and within the environmental forces around us, and we form in response to them, as the environment bends in response to our movements and actions. What Manning expresses so well, and what I am trying to articulate, are the always-present processes of coming together that occur between thought, intuition, action, and materials. These processes are always dynamic, negotiated, and often unpredictable and turbulent, even if we don’t always notice or acknowledge their influence. Alongside the material practices described above, atmospheric-making also incorporates a series of bodily practices aimed at becoming attuned to the presence of subtle, turbulent relations within our immediate environments. As Manning suggests, we can begin to modify our bodily capacities by attending to affects and the not-quite-seen, and develop our sensitivities to these otherwise subtle forces and influences. This is the reciprocal dynamic—the ‘being affected by’—that occurs in relation to our capacity to affect through actions, both direct and implicit. This quality of ‘being affected by’ has been emphasized in various creative practice workshops in which I have participated. These have been organized by the Affective Environments Laboratory and the obscurely named PPPPP research group (both based at RMIT),  as well as the Australian group working as part of the Immediations research project initiated by Erin Manning, Brian Massumi, and the SenseLab at Concordia University in Montreal. These workshops have addressed issues such as nonverbal collaborative material play and questions such as “how do you pass on an act of listening?” and “how do you amplify and expand in order to slow down?” These questions were approached by working collaboratively with materials at hand to encourage an increased sensitivity to materials and subtle bodily movements. Figure 6. PPPPP Practice Group, 2013. Video stills from group improvisation with Chris Cottrell, Federico Passi, Juri Kermik, Phillipa Rothfield, Adele Varcoe, Neal Haslem and Mick Douglas. © PPPPP (Mick Douglas, Ceri Hann and Neal Haslem), 2013. Used with permission. These working processes have resulted in an increased vividness in bodily and material interactions. For example, in the PPPPP workshop (Figure 6), groups improvised an ongoing series of material relations without any verbal communication. This brought material qualities to the foreground of awareness. 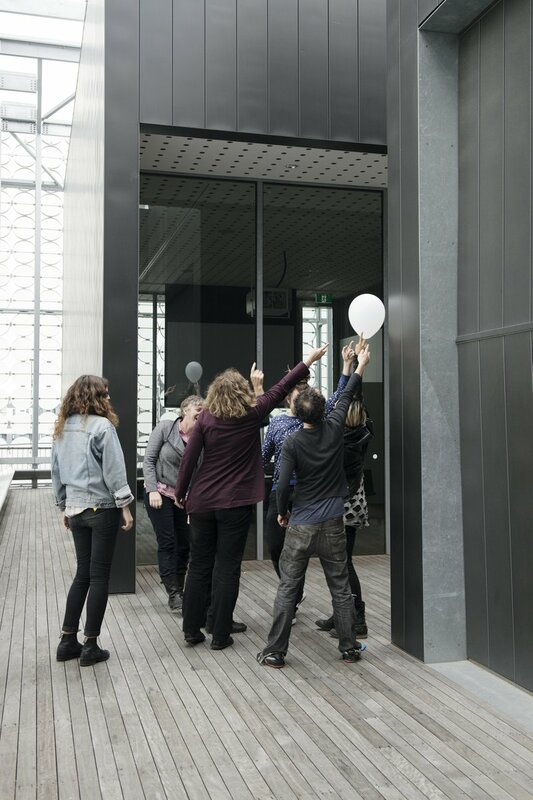 A short part of one of the Immediations workshops resulted in a group of us standing together in a circle, eyes closed, elbows lifted slightly away from our rib cages, each with an index finger applying the lightest possible touch to a single balloon in the center of the group. Rather than staying in a state of equilibrium, the balloon somehow gathered momentum and took flight. 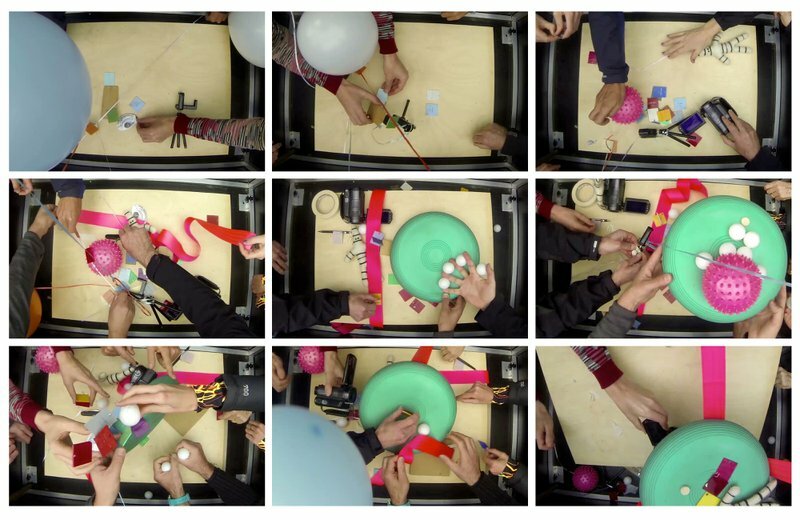 Applying the lightest possible touch while still contributing to the holding of the balloon is an expansion of bodily capacity, and the sum total of these lightest possible touches is an expected movement away from equilibrium (Figure 7 and 8). This act of fine-tuning bodily and material sensitivities to subtle, ephemeral conditions is an example of what Kathleen Stewart refers to as atmospheric attunement, “an attunement of the senses, of labors, and imaginaries to potential ways of living in or living through things. A living through that shows up in the generative precarity of ordinary sensibilities.”  To practice atmospheric-making requires attunement to ways of working with things, and to the ways that things work on our own capacities. Figure 7. 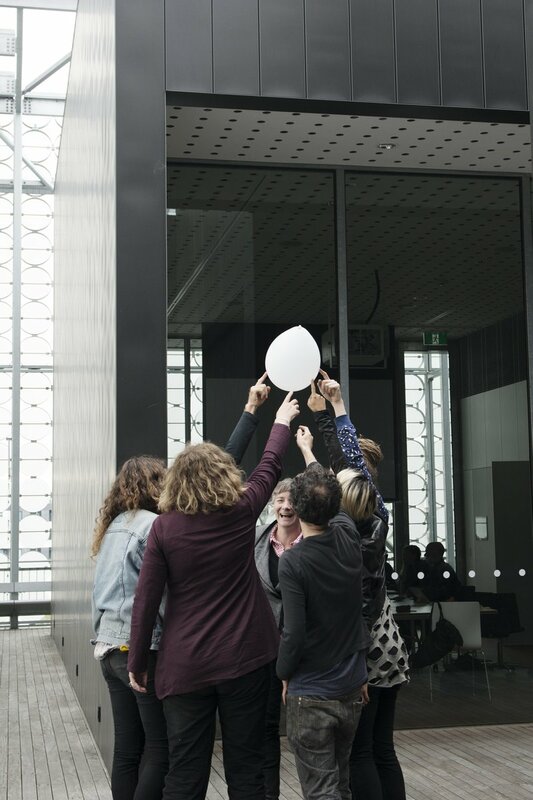 Immediations Workshop, Melbourne 2014. Photograph by Georgina Matherson. © Georgina Matherson, 2013. Used with permission. Figure 8. Immediations Workshop, Melbourne 2014. Photograph by Georgina Matherson. © Georgina Matherson, 2013. Used with permission. Another simple practice through which bodily capacities and sensitivities can be expanded involves directing attention to the act and qualities of breathing. Breathing is a literal taking-up and reworking of atmospheres in lived experience and offers access into some of the less tangible concepts of affects, atmospheres, and reciprocal formation. Thinking through breathing provides a metaphoric or diagrammatic structure that can open up an understanding of these ideas and acknowledge the agency of air in our subjective formations. Figure 9. Chris Cottrell, Breathing. Space. #10, 2013. Ink on paper, 21 cm x 15 cm. 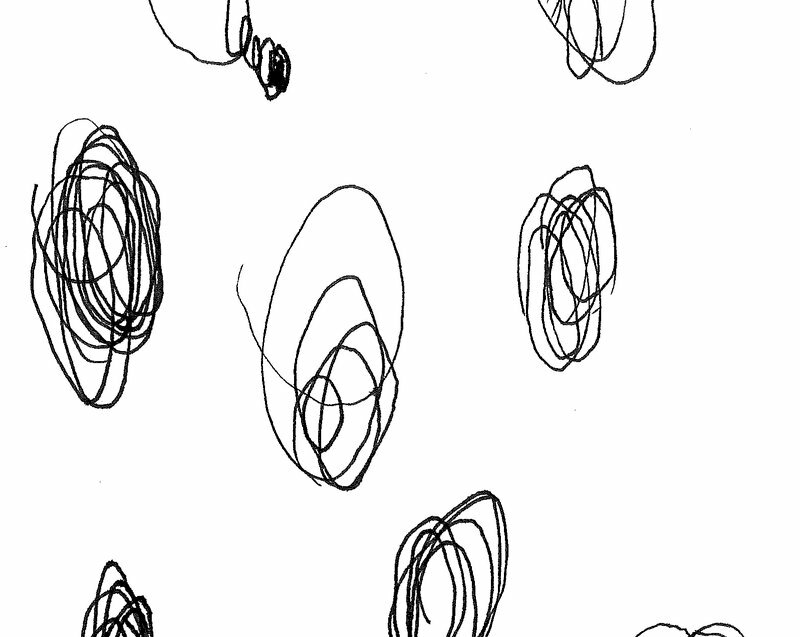 Detail of inhalation-exhalation drawings. © Chris Cottrell, 2013. Courtesy of the artist. A more developed project exploring these ideas of breath as co-formation between an audience and the surrounding atmosphere was Breath Clouds (Figure 10 and 11), an audio-visual installation that I produced with the assistance of Jeff Hannam from the SIAL Sound program at RMIT University. This project developed from an interest in the dynamics of breathing and listening as ways of being both outside and inside my body, at once expanding the body and internalizing the environment. What I breathe and what I listen to, expand the limits of my body in a reciprocal process of internalizing spatially distributed intangibles. Breath Clouds set up feedback loops between these two modalities. 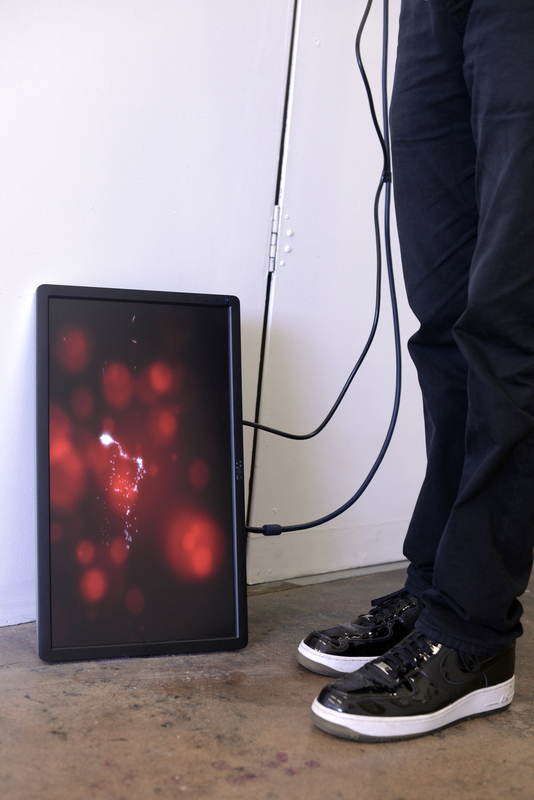 It used atmospheric sensors to manipulate a soundscape and a visualization. 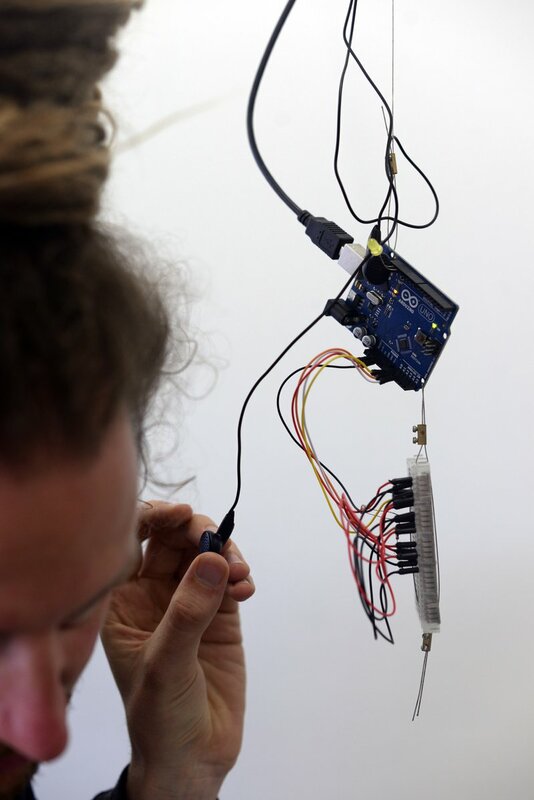 The aural component was rather quiet in order to encourage close audience engagement, bringing people into close proximity with the sensors, which would then alter the qualities of sound and visualization in response to atmospheric changes that resulted from their breathing. Figure 10. Chris Cottrell and Jeff Hannam, Breath Clouds, 2014. Electronics, software, air and breath, dimensions variable. Installation view at BUS Projects gallery. Photograph by Anthony Fryatt. © Chris Cottrell and Jeff Hannam, 2014. Used with permission. Figure 11. Chris Cottrell and Jeff Hannam, Breath Clouds, 2014. Electronics, software, air and breath, dimensions variable. Installation view at BUS Projects gallery. Photograph by Anthony Fryatt. © Chris Cottrell and Jeff Hannam, 2014. Used with permission. Across both material and bodily registers, the experiments in atmospheric-making discussed here provided an ongoing development of the body’s capacity to actualize, as well as a reworking of bodily capacities that can lead to an enhanced sense of atmospheric attunement. This increased sensitivity brings to the foreground an awareness of the various forces and turbulent undercurrents present within lived activities and creative practices. Atmospheric-making involves the thinking-with and perceiving-with of material and immaterial qualities, and reveals negotiated and unpredictable processes of coming together. These qualities and processes continue as the foci of my ongoing creative research practice, which aims to build towards more complex, larger-scale constructions that offer opportunities for the expansion of bodily capacities. Jane Bennett, Vibrant Matter: A Political Ecology of Things (Durham, NC: Duke University Press, 2010), viii. For example see his early writings on particles and the idea of dissolution in Kengo Kuma, “Dissolution of Objects and Evasion of the City,” Japan Architect 38 (2000): 58. Kathleen Stewart, “Atmospheric Attunements,” Environment and Planning D: Society and Space 29, no. 3 (2011): 452. Mark Wigley, “Towards Turbulence,” Volume 10 (2006): 6. Francisco Varela, Ethical Know-How: Action, Wisdom, and Cognition. Writing Science(Stanford, CA: Stanford University Press, 1999), 12. Erin Manning, Relationscapes: Movement, Art, Philosophy. Technologies of Lived Abstraction (Cambridge, MA: MIT Press, 2009), 95. Affective Environments Laboratory Web Site, http://www.aelab.org, and the PPPPP Web Site, http://www.ppppp.net.au (both accessed March 6, 2015). The Affective Environments workshop was initiated by Scott Andrew Elliott, Olivia Pintos-Lopez, Pia Ednie-Brown, and Chris Cottrell. Student participants and collaborators were Katherine Brown, Daniel Colaneri, Leanne Failla, Stephanie Gleeson, Frankie Gordon, Freya Robinson, Jack Ryan, Jaime Vella, and Ben Warren. The workshop culminated in a public exhibition of four installation works, a collaborative documentation system, as well as other works by Pia Ednie-Brown, Jondi Keane, Adele Varcoe, Zuzana Kovar, and Nick Skepper. Chris Cottrell is a lecturer in the Interior Design program at RMIT University, where he is also exploring ideas of atmosphere, turbulence, and thresholding as research towards a practice-based PhD. He previously studied Architecture at the University of Auckland and has a Masters in Fine Art from the Edinburgh College of Art. He works primarily in installation and performative art contexts to explore issues of spatial perception and representation. 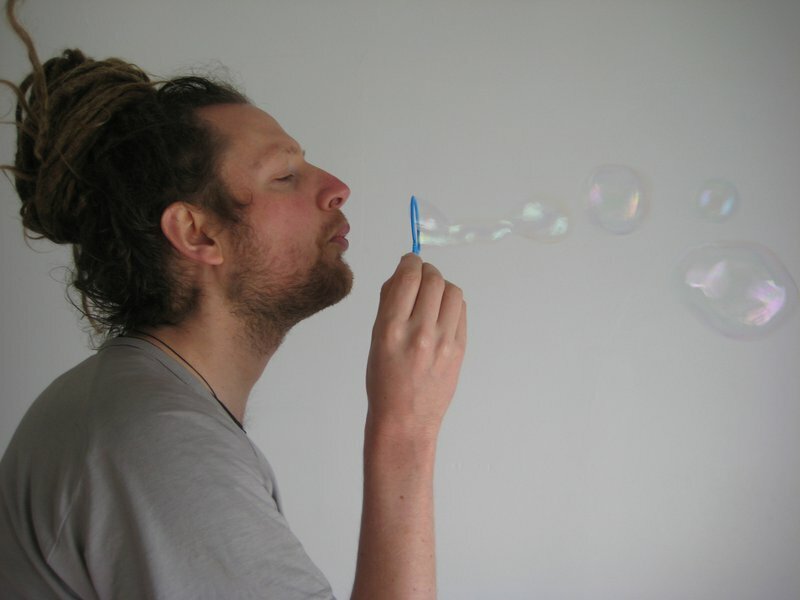 He has exhibited work extensively in New Zealand, Australia, and the United Kingdom, and has held artist residencies in Slovenia, the Orkney Islands, and Fox Glacier, New Zealand. Research projects are archived at www.make-do.net.